This fabulous throw is knitted using a modified version of the ever popular ripple or wavy stitch. Made with top quality Berlini Merino Velvet Worsted superwash merino wool yarn, this knit afghan is soft and cozy and will keep you warm on chilly evenings. 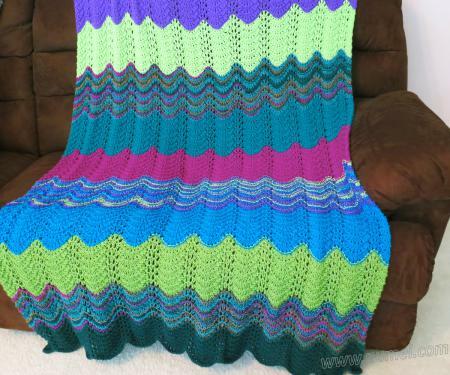 The colors of this ripple afghan can be easily customized with your favorite colors to fit your decor. Select from a wide range of colors that are available. Knitted Measurements: L 66" x W43"
R3: K1, *[(Knit 2 sts together) x 3, Knit in front and back of next stitch, (Yarn Over, K1) x 4, K in front and back of next stitch, (Knit 2 sts together) x 3], repeat * till last stitch, K1. R4: K1, Purl to last stitch, K1. Cast on 200 stitches, placing marker after the first stitch, then after every 18 stitches, till the last stitch. Work in Pattern Stitch, repeating Rows 1-4 in color sequence above, joining a new ball of yarn as each ball is used up. When you get to the last ball of yarn, be sure to leave enough yarn to bind off on the final row. Block throw/afghan for best results.